My friends: Soon it will be full-on fall with the colors and the cooler weather (and the costumes). It’s my absolute favorite time of the year to be in the kitchen. Something about the season really inspires me to cook more. 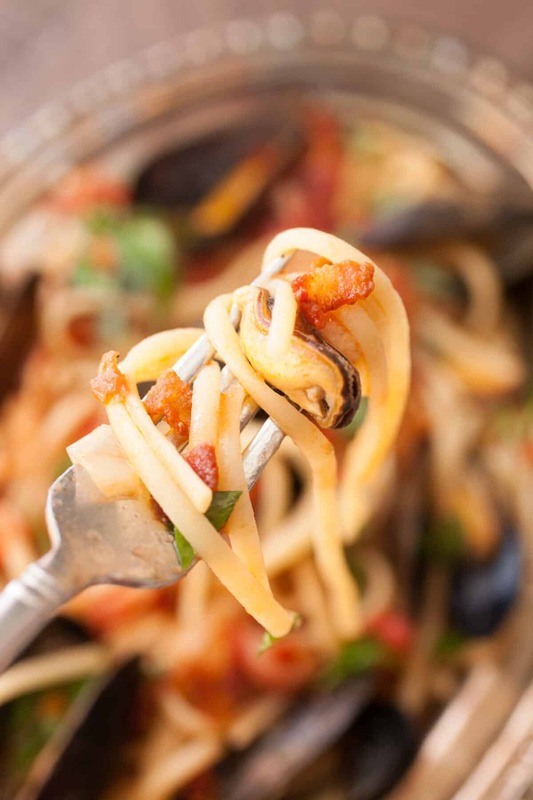 Maybe it’s just because I feel like curling up on the couch with a big bowl of this spicy mussel linguine. To be honest, I usually eat and serve mussels in a simple broth with lots of crusty bread. 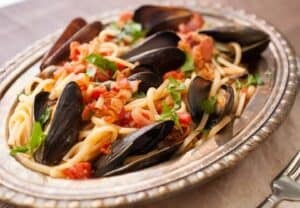 It ends up being a heavy appetizer or a tapas style meal, but this linguine dish kicks the traditional mussels dish up a notch into a full-fledged meal. Most importantly: Don’t be intimidated by the mussels. They are easy to cook and make for a great, classic Italian pasta dish. 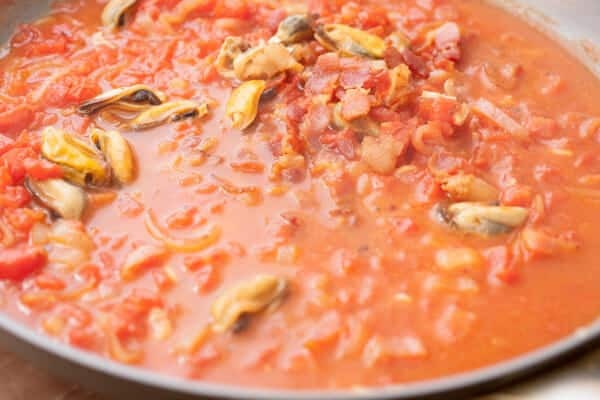 This is a classic Italian dish packed with fresh mussels plus a light tomato sauce and crispy bacon. Surprisingly easy! 1) Scrub and rinse mussels. If you have time, let them rest in clean cold water in the fridge to flush out any sand. Pull out any mussel “beards”. 2) In a large skillet, add chopped bacon over low heat. Let the bacon slowly render out until crispy. 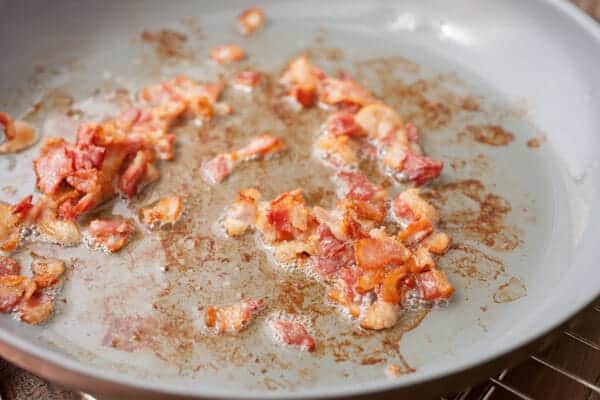 Remove bacon with a slotted spoon, leaving the bacon grease. 3) Add chopped shallot and garlic to the skillet and cook for a few minutes. Turn heat up to medium. Add white wine, vegetable stock, and cleaned mussels. Cover the skillet and cook until mussels open and are cooked through, maybe 5-6 minutes. 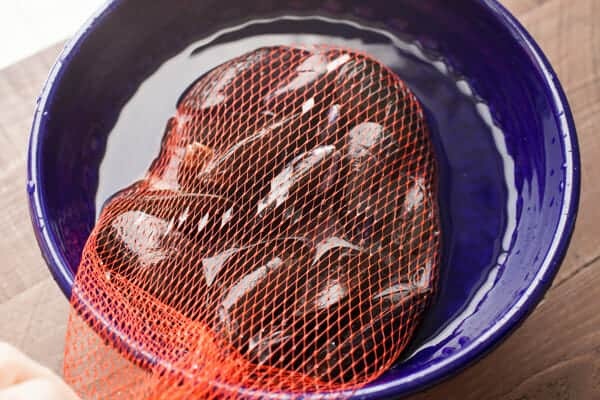 4) Remove mussels from the skillet and taste one. If they are sandy at all, rinse them with cold water to rinse off as much sand as possible. Then remove about 3/4 of the mussels from the shells. Leave some in the shells for presentation. 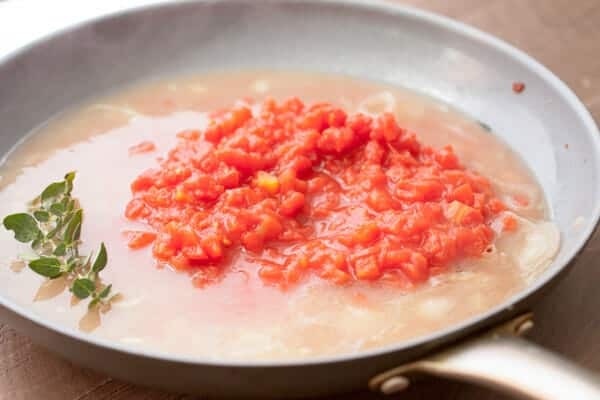 5) Add diced tomatoes to the skillet with the shallot mixture and juices. Bring to a simmer and cook until the sauce thickens, maybe 5-6 minutes. Season sauce with red pepper flakes, salt, and pepper. 6) Meanwhile, cook linguine in a large pot of salted water. Cook until al dente. Drain and reserve about 1 cup of pasta water. 7) Add about 1/2 cup of pasta water to the thickened tomato sauce and stir together until it’s the right consistency. Add cooked mussels back into the sauce. Add linguine in the skillet and toss well to combine. 8) Transfer finished linguine to a large serving platter. Top with crispy bacon and chopped parsley. Serve immediately! Roughly adapted from this NY Times recipe. Alright. Let’s talk mussels. You can find fresh mussels in many stores these days. The mussels should be stored on ice (obvious?) and be closed or they should close if you touch them if they are slightly open. Basically, they should be alive. When you get them home, scrub the mussels to remove any dirt on the outside and pull out any “beards” that are on the mussels. These are the fibers that the mussels use to attach to the rock. 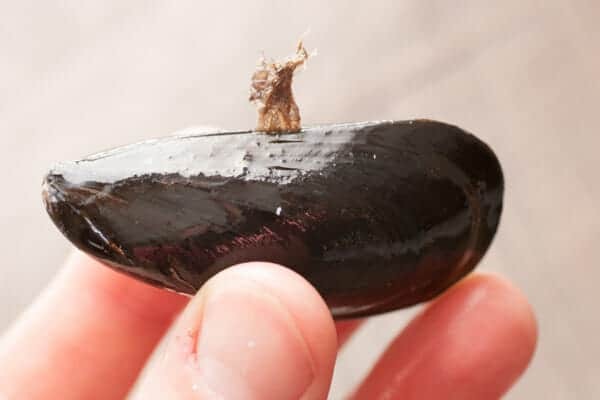 Some mussels might not have them, but if they do, you can just gently pull them out. If you have time, it’s nice to also let your mussels flush for a while by letting them sit in clean cold water in the fridge. Okay. Let’s get started. I like to use a little bacon as a base for this pasta dish. You don’t need a ton. Just a few strips of bacon will work great and add nice flavor to the dish. Chop up your bacon and add it to a skillet over low heat so it can slowly render out. This is what you’re looking for! Then remove the bacon from the skillet, but leave the bacon grease, and add the garlic, shallot, mussels, wine, and vegetable stock. Cover the skillet and turn up the heat to medium. Let the mussels steam for 5-6 minutes until they open up and are cooked through. At this point and y mussels that DO NOT open should be thrown away as they might be unsafe. Remove your mussels from the skillet at this point, leaving just the shallot, garlic, and liquid. This is a great base for the sauce! Add your tomato to the skillet along with a small sprig of fresh oregano (optional). While that simmers, check out the mussels. Taste one. If it’s really sandy, it’s okay to rinse them off with some cold water to remove any extra sand. Then pull out most of the cooked mussels but leave some in the shell for presentation later. Add the cooked mussels back to the skillet. 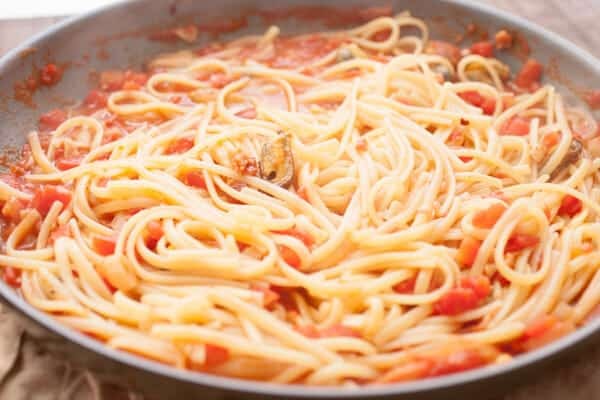 Ideally, the sauce will cook down until it’s nice and thick and you want to use some reserved pasta water to thin the sauce back to this consistency. Toss in the pasta and, most importantly, taste this sucker. You’ll want to season it with some red pepper flakes, salt, and pepper. If the sauce seems too thick, add a bit more water. If it seems too thin and won’t stick to the pasta, toss it for a few more minutes in the skillet to thicken it. To finish this beauty of a classic Italian dish, transfer everything to a large serving platter and add in the mussels in the shells, crispy bacon, and parsley. 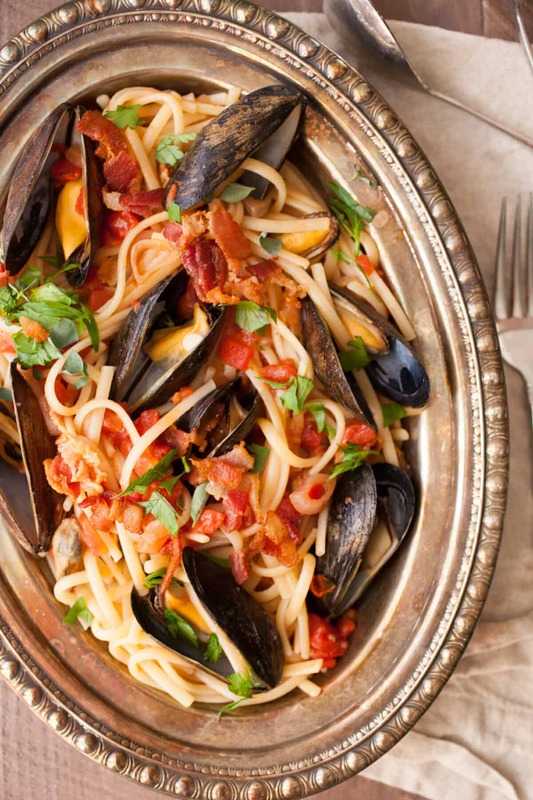 This spicy mussel linguine recipe will serve 3-4 people. It’s a great date night dish if you want a little leftover or it could serve a family of four with a side of bread or side salad. It’s really classic flavors though and I love it as a nice change-up from the classic weeknight marinara option. Who are my mussel lovers out there? Leave a comment! 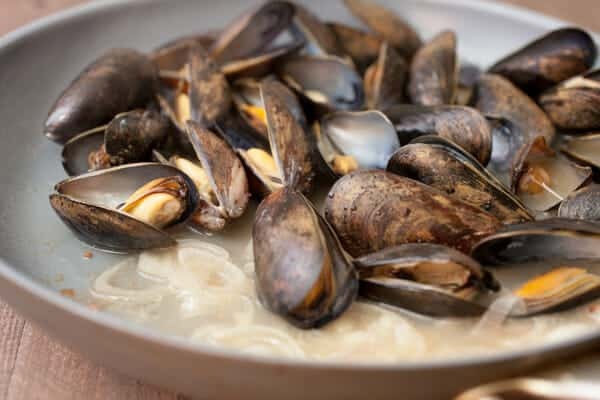 Actually, any unopened mussels after cooking are actually SAFER to eat than the open ones that get pulled from the pot early. here is a good article describing the debunking of this myth. http://frdc.com.au/research/Documents/Final_reports/2002-418-DLD.pdf. the important part for this discussion starts on page 13.